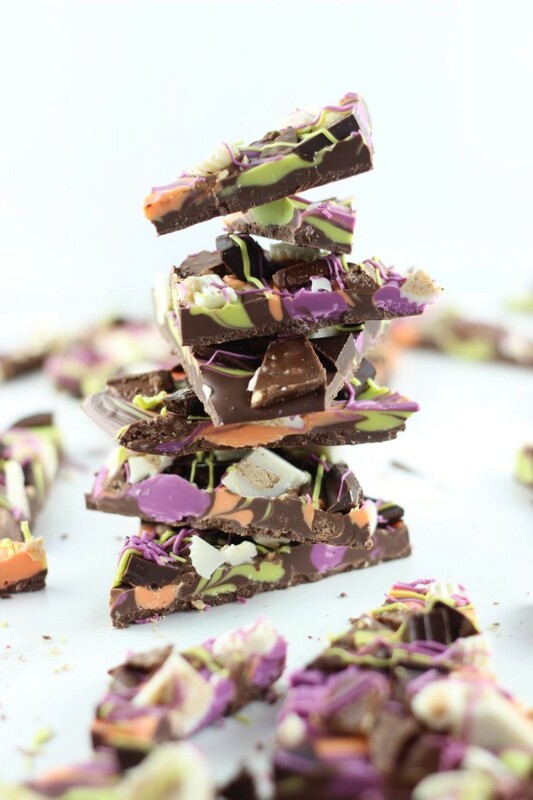 Chocolate bark topped with assorted leftover Halloween candy! 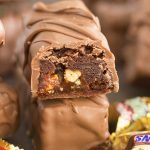 An easy way to use up leftover candy bars! I am not much of a Halloween person, and never have been, but I can always get on board with the candy. Costume? Not so much. I have never enjoyed dressing up for Halloween. The best costume I ever had was circa 1990 when I dressed up as Tom from the Tom & Jerry cartoons in a gray cat costume, and carried around my stuffed animal of Jerry. If that is my best costume, that tells you a lot. Still, if you knew how much my brother and I loved those cartoons as kids, you might appreciate that costume. But even as a kid, I wasn’t all that wild about Halloween. I can’t take the pressure of coming up with a novel or creative costume idea! And if it’s not going to be novel or creative, then the next option is something funny or clever. Too. much. pressure. 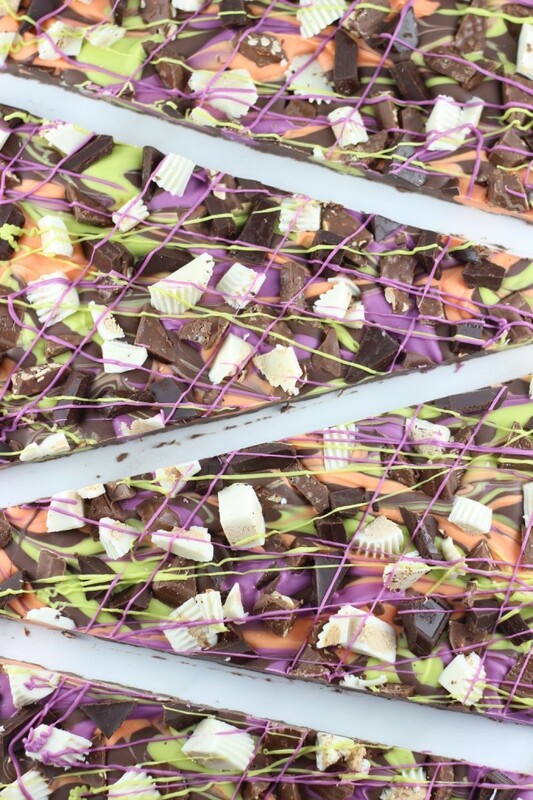 Basically, the exact opposite of this Leftover Halloween Candy Chocolate Bark. 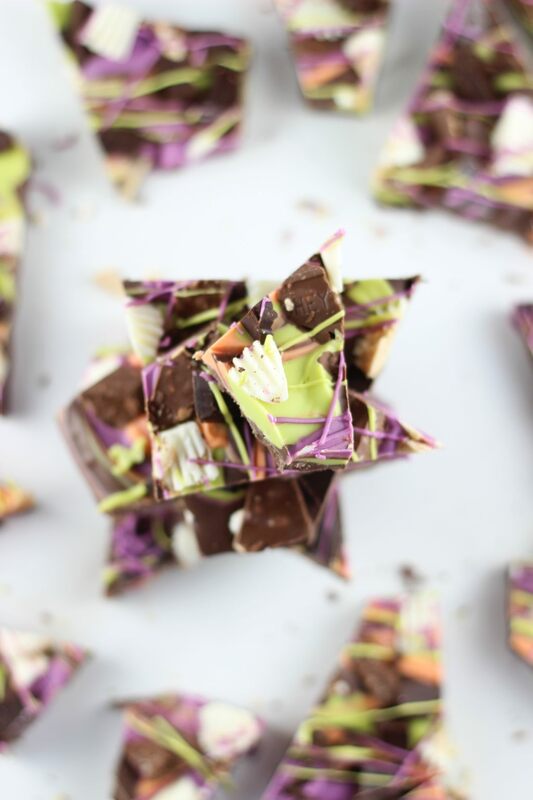 This is a no pressure, super simple candy. 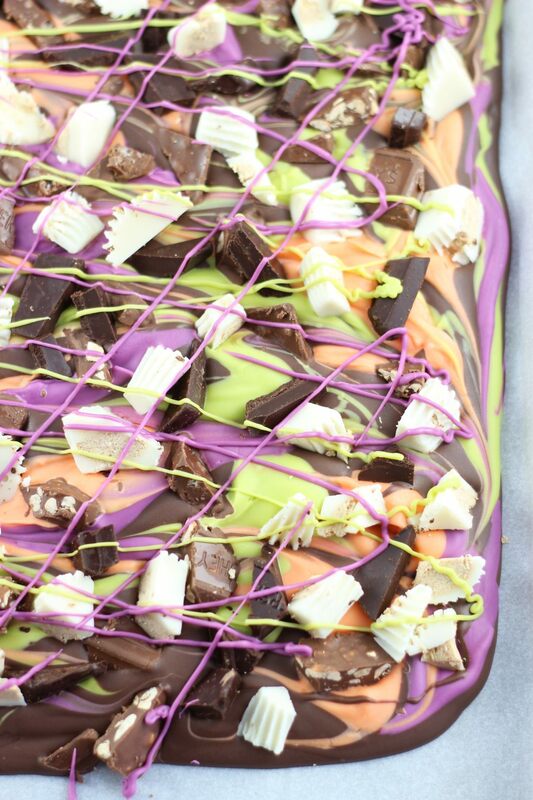 Melt chocolate, swirl it with more chocolate, and top it with chopped candy bars. Boom. That’s it. 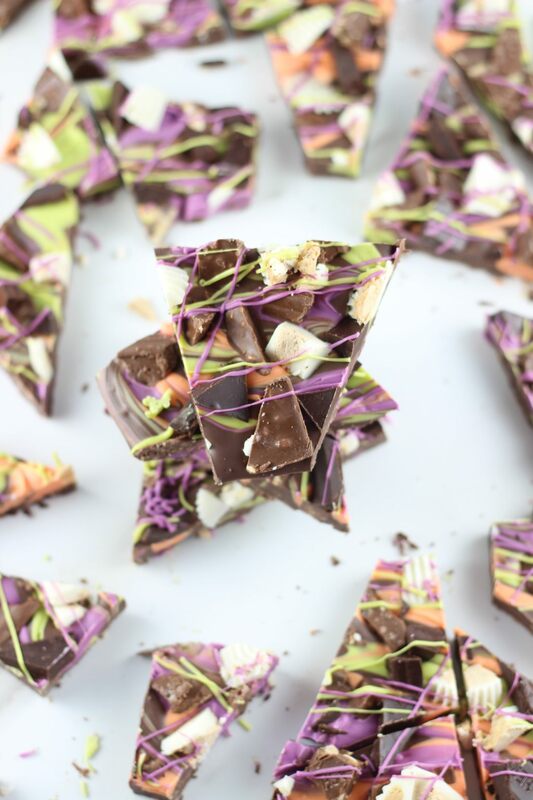 It’s festive, it’s delicious, and it uses up leftover Halloween candy. We bought 3 large bags from Sam’s Club that amounted to about 450 pieces, so we are SET over here. I had plenty to spare in the making of this bark, and it’s not even Halloween yet. 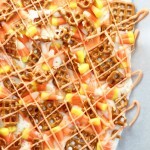 You likely will have leftover candy following October 31st, and this is a fun way to use it up! It’s obviously an extremely versatile recipe too, so you can suit it to your fancy. 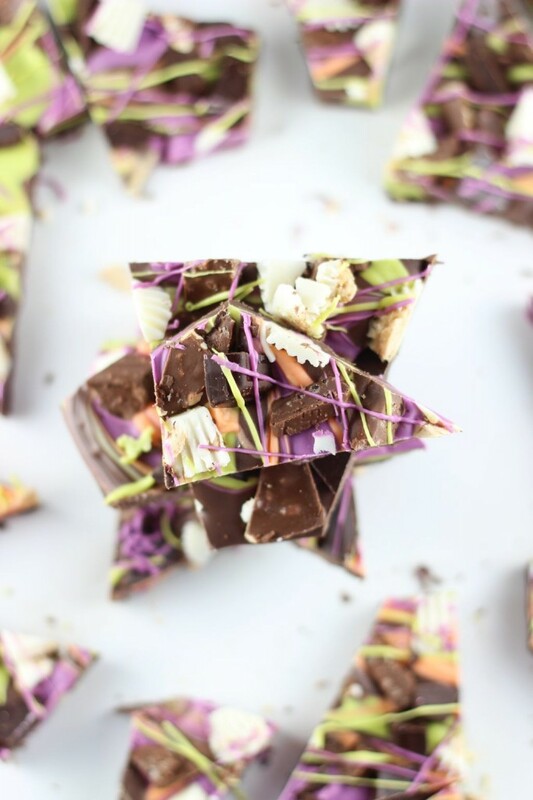 I know there’s a lot of leftover candy chocolate bark recipes out there (and spoiler alert: I have another coming up soon), but it just wouldn’t be Halloween if I didn’t throw my version out there too. If my version offers something different, at least, it’s those swirly purple, orange, and green Halloween colors. It makes this especially festive, no? 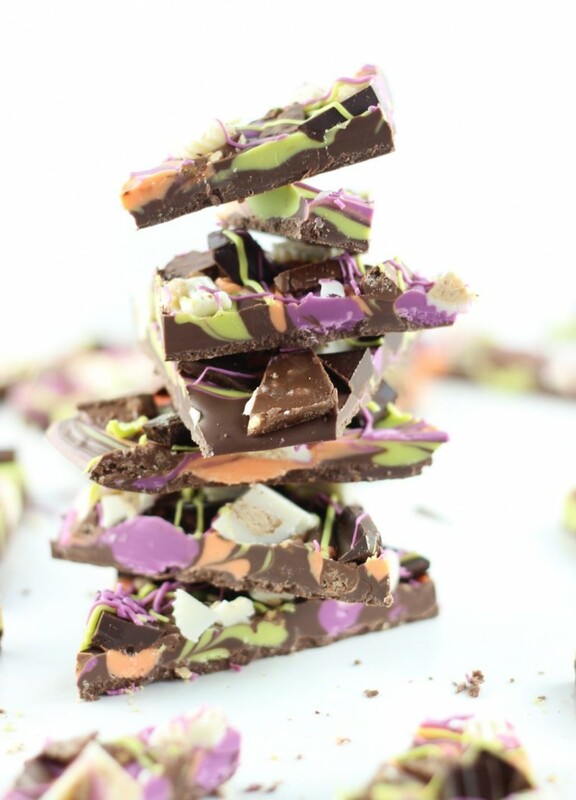 Chocolate bark topped with assorted leftover Halloween candy! 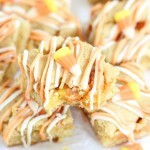 An easy way to use up leftover Halloween candy bars! Assorted Wilton melts colors I used green, orange, and purple. They are packaged in 12-oz. bags, and you only need half a bag of each color. 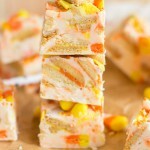 Unwrap the assorted candy bars, and chop them coarsely. Set aside. 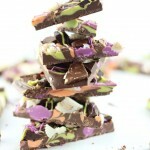 Place the chocolate almond bark in a large microwave safe bowl. 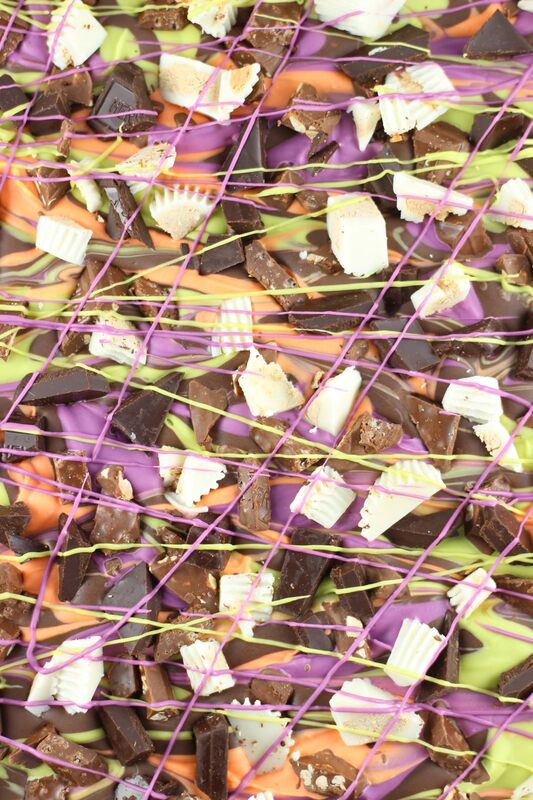 Microwave the chocolate almond bark at 30-second intervals until melted and smooth. Spread the chocolate onto the parchment paper in a thin, even layer. Pour half of each bag of Wilton melts into separate small microwave safe bowls. Half a bag of green melts in one bowl, half a bag of orange melts in another bowl, and half a bag of purple melts in a third bowl. Microwave each color of Wilton melts for 30 seconds to start. Stir, then continue microwaving at 15-second intervals until each is melted and smooth. 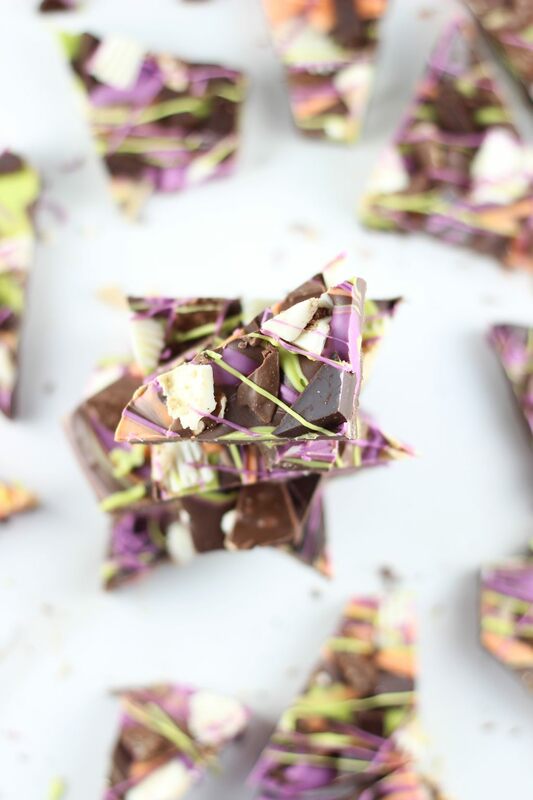 Drizzle the different Wilton colors over the chocolate almond bark, and then use a knife to swirl them together. 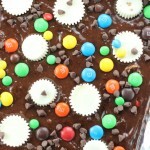 Sprinkle the chopped candy bars evenly over the chocolate. And how about that tall stack of chocolate, eh? 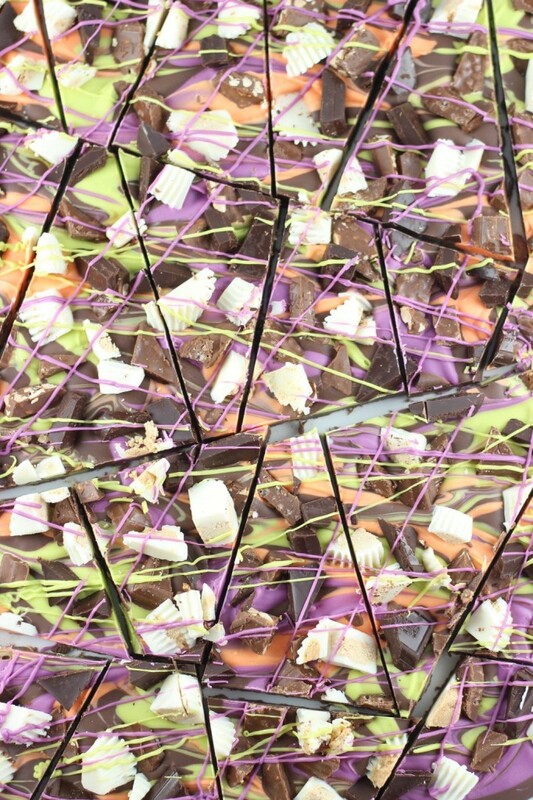 It was like chocolate bark Jenga. I just kept stacking it higher…. They are so artistic. I love how they look. I pinned at the Pinterest board. Thank you for your participation at Tasty Tuesday Creative K Kids.